Among the nationally prominent handicappers set to participate as a guest handicapper are NBC Sports' Bob Neumeier, ESPN College Game Day's Chris Fallica, Daily Racing Form's Marty McGee and Byron King, TVG and Horseplayernow.com's Caton Bredar and SiriusXM at the Races' Steve Byk. Keeneland will provide each Handicapper of the Day with a $200 bankroll to wager over the course of the race day, with winnings going to support PDJF. 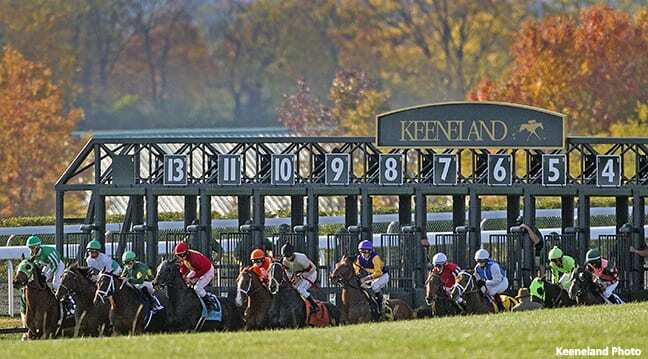 The @BetKeeneland handle is a valuable resource for handicapping Keeneland's Fall Meet. The Twitter feed also will provide scratches, changes, clocker reports, track conditions, race results, expert picks and carryover information. Keeneland's Fall Meet begins Friday, Oct. 6, and runs through Saturday, Oct. 28, with racing Wednesday through Sunday. Post time for the first race daily is 1:05 p.m. ET. This entry was posted in Horseplayers and tagged betkeeneland, Bob Neumeier, byron king, Caton Bredar, chris fallica, christa marrillia, Handicapping, horseplayers, Jeremy Plonk, Keeneland, Marty McGee, nancy lasala, permanently disabled jockeys fund, steve byk, twitter by Press Release. Bookmark the permalink.